When you decide to start a lawsuit, it can be confusing to identify the responsible parties. Sometimes there are a lot of people involved in your injury; maybe you're suing a business, and you're not sure about its official name or who the owners are. Factual investigation is often a crucial part of starting a personal injury lawsuit. You can select more than one defendant to sue if that person or company is somehow connected to the harm you suffered. There are "necessary" defendants -- people without whom a court will not be able to evaluate all the facts of your case or reach a conclusion. 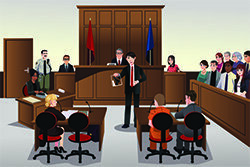 "Permissive" defendants are not essential to the case, but if your dispute with them involves the same facts and issues as your dispute with the necessary defendants, you can usually include them in your lawsuit. You may also want to expand your lawsuit to parties not directly involved but still liable. For example, if you are suing someone who harmed you in the course of performing a job, his or her employer may be liable. If a poorly designed or malfunctioning product is involved, you may be able to sue the companies and individuals involved in the product's design, manufacture, distribution or sale. Suing individual owners of corporations, or a corporate parent of a subsidiary, can be difficult. The corporate structure limits liability, but there are exceptions. A court will "pierce the corporate veil" when fraud is involved or when justice demands it. Before filing your lawsuit, you need to consider all those who have a connection to your claim. An experienced personal injury attorney can help you evaluate the facts of your case and determine who to sue.